How long to learn to foil. Sorry should have put more info, 82Kg, sailing in Perth so I guess normal seabreezes are 15-20 but guessing I would be learning in the river so a bit less. sounding like more volume is a good idea. I suppose I was wondering once you are up on the foil is the board size very important? I was uphauling a 123 isonic but havent tried it on anything smaller for a long time. Jeff - you'll be able to uphaul the Wizard 125. I can uphaul the 105, but it's tricky and I water-start if at all possible (from about 10-12 knots). Wait for 12-18 knots for your first foil sessions, then you can water start. After 4 or 5 sessions you won't be falling much - so then if you foil in sub 12 knot winds you'll only be needing to uphaul occasionally. You should be able to tack the 125, but probably will find tail-sink gybes easier from your first session. I reckon to get the most carvey fun from the Slingshot Hover foils you don't want bigger than the 125 board. If you are still learning, you want to be able to uphaul. The instructors in the Gorge all say that if you can waterstart, the sail is too big for beginning windfoiling. I am using a formula board. Strong deep tuttle finbox, floaty, lightweight, lots of deck for moving your feet. With a fin, formula boards are famously difficult to get planing due to the massive nose rocker that requires you get it up over its own bow wave. However, with a foil the board gets planing very easily, and the nose rocker keeps the board from perling when you inevitably slap it down. Windfoilers in San Francisco and all over Europe use mostly formula boards, especially for racing. If you find that the footstraps are too outboard for windfoil learning, keep the front straps in place, but remove the back straps altogether and put your back foot more in the middle. If you have a single chicken strap, it is perfect for this. This stance lets you exercise excellent control over both roll and pitch. Imax1, I would say if using a tuned kit such as a Starboard Gt foil and JP Australia foil 135 for example you could be foiling in 1 to 4 sessions if in flat water with 12-15 knot winds. Having a board that compliments the foil is ideal. 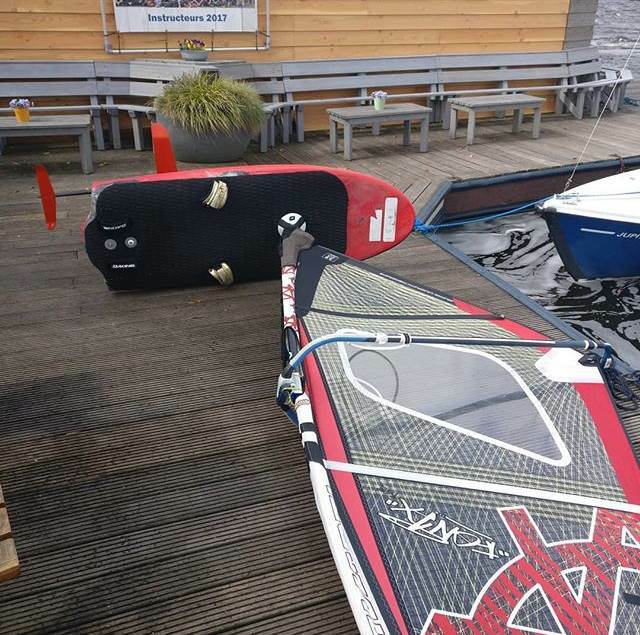 Maddlad, on the more powered up (stronger winds) foiling days some of our local riders using the JP A 135 foil board and the Starboard GT-R foil which uses the 95cm fuselage like to switch down to the 75 fuselage for even more control. This could partly be down to those rider weights being 75kg and less. Not sure if you have experimented with the 75 and 95cm fuselages? I feel like fuseledge size doesn't get enough attention. There are many different fuse lengths from 70, 95 to 115cm! Would you say a longer fuse works better with bigger boards, ie formula boards and bigger sails (7.5>)? I use a Neil pryde AL( pinkie, bluey) with a fuseledge of only 70ish cm ...the way the fuse tapers off at the back i would be wary of one any longer for this foil. To my limited knowledge a longer fuse is more stable, more lift?, better with bigger sails, better upwind angle. It's more sensitive in pitch stability; you have less time to reacted in up/down movements of the board. Can17, I totally agree about the fuselage not getting enough attention. Our riders using the Starboard GT-R or Race (95cm mast), found the 115cm fuselage to be very powerful when used with JP135 Foil board and thus the 95cm or 75cm were preferred on this board. The 115 fuselage however was found to be a lot more comfortable on the Starboard wide boards (90cm plus). It appears that the Starboard wide boards have the front footstrap positioning further forward compared to the JP135 foilboard making the 115 fuselage feel balanced. The longer fuselage is more powerful, more lift and is more stable as you noted and offer better upwind angles and gives a more locked and loaded feel. For ultimate lightwind performance the 115cm fuselage is a must. The challenge is that when the winds increase the 115cm fuselage can be a handful and this is where dropping down to the 95 0r 75cm fuselage can offer more control as they are less powerful. Saying that one of our experienced foil riders uses the Starboard 115 fuselage only and in winds up to 23kts and just drops down in front wing size to 550cm to reduce lift. Fuselage length is indeed important. One huge factor that needs to be emphasized is that the Starboard 115 cm fuselage places the front wing a good 4 inches further foward than does the 75 cm fusy. Again, and I emphasize this all the time, you MUST get the front wing at the mid point between your feet for balance. Too far aft, it won't lift. To far forward, you can't avoid foiling out. The footstrap positions on the Starboard 147 offer enough flexibility to move your feet forward and aft for balance with different foils. Many other boards--somebody mentioned the JP 135--offer limited footstrap positions. For those boards you have to get the right foil such that the front wing is between both feet. For my old formula board the front wing was too far aft, and I had only one footstrap position. I had to practically step off the stern to get it to lift. I had the finbox moved forward (and reinforced while they were at it) to get everything in balance. Now it is a balanced joy. Yes, I've experienced this on my formula board aswell with the front wing being to far aft. Your foil must be one that has a 4 hole top plate like slingshot, naish, manta and others. Some brands like Neil pryde and AFS don't give you that option for windsurf foils. Has anyone successfully windsurfed a wizard. I know it's not recommended from the short lengths especially the 105. But what about the 125 or 150. I'm just thinking people windsurf the jp 135 (215cm). Wizards (125 and 150)about 12cm shorter though. Hey CAN17, my main foil is an AFS-2, which is just a fixed deep tuttle top in one monocoque with the mast. Just like Starboard and LP. For that foil I had my formula board finbox moved 3 inches forward to get the balance. Now it is perfect. I have that same formula board, with an unmodified finbox, in Florida. For it I use a Slingshot hybrid with a Power Plate to both move the foil forward as well spreading the load since the finbox is not reinforced. It looks just like the slingshot fwind1 and has identical specs I believe. They also say this foil works with slingshot Wings. They are sold with a 4 hole conversion plate which then you can buy the power plate like you have. I have not heard or see much about them as they are a windance exclusive. They say, "You Love it or Return it, no problem"
The Wizard 105L is awesome - short at 5 ft 10 inches, but once you're gybing the "no-nose" is all pluses in the ocean - lack of swing-weight means turns are sharper and you're less likely to plough into a swell downwind and upwind. I'd happily ride the 5 ft Wizard 103L. I might use a longer board if it's super light (8-12) and uphauling and early planing are important. I have a Tuttle PowerPlate with a Foil Works for my 122L Go it is great, i am very pleased with it. Let me know if you have any specific questions. I have changed out the front wing to a Slingy 84cm Infinity for light winds at my local spot, but its by no means a necessity to do so. I want to emphasize what segler says about fuselage lengths. The overall dimensions are not whats important, its the position of the front wing relative to the mast, and the position of the stab relative to the mast. I have lately been testing 2 fuselages for F-One, one which has only been extended in the front, and one which has been extended to the front and back equally. The difference in power between the 2 is minimal (would dare to say not existing, might be due to a 84m difference in the back not being that much, but as seen below difference in stability is really noticable) However, the difference in stability is really well felt. The fuselage which has also been extended to the back feels a lot more locked. Have to say however that I only like this more locked feeling together with a longer mast (95cm or more), for when riding in chop with the long one and an 85 mast I sometimes just couldnt react to the chop fast enough. With the short one I never have a problem of "overshooting" a wave or piece of chop with the 85 mast and pretty much never touch, not even in 3-3.5m waves at sea. However with the longer fuse and shorter mast I touch the water more regularly due to some sort of delay in reactiveness. so to be clear, here I'm talking about 2 fuselages, equal in mast-frontwing dimension, but a 4cm difference in stab-mast dimensions. I still do not believe in having the front wing at 50% between the footstraps, since the position of power (fore-aft) from the foil also depends on the ratio frontwing surface/stab surface, wing shapes and a lot of other factors, meaning this position is far from clear cut. It may very well be accidentally teue for the AFS / Seglers board setup, but can in my opinion not be generalized to the bigger spectrum of possible setups. These differences are really large, to illustrate: keeping all settings the same but switching to my 850 wing from my 1000wing, which in chord and position are equal, shifts the power forwards loads, because relative to the stab the smaller frontwing has less power. As a measurement I always take my "comfortable" (I trim for more frontfoot preassure on purpose, so comfortable isnt the right word, but I hope you get my drift, talking about 50/50 load over the legs I think) backfoot position during a reach, which with the 1000 is about 15-20cm in front of the backstrap, but when switching to the 850 is about 5cm behind the frontstrap to entirely against it. hope I'm not getting too technical. Simply said, if you get a matching set you are going to fly in a few sessions, and it helps loads if you let an experienced foiler (meaning one who at least sometimes does his jibes in the air, because that is the #1 sign of good trim) setup your kit for you to make it all easier and prohibit you from learning faulty technique to compensate for bad trim. I have helped a number of beginners and frustrated intermediates with their foiling. No, I am far from being an expert, but I know what works. The very first step has always been to set the footstraps, or power plate, such that the front wing is at, or near, the 50% point between front and back feet. Then we set the mast base at 44 inches in front of the leading edge of the foil mast--this is pretty close to 44 inches in front of the front screw for most foils. To a man, everyone of them told me that these starting point settings got them flying more quickly and controllably than anything else they had tried. From there you can fine-tune the settings to make things even better. Your board, rig, foil, and you are all a big teeter-totter that rotates on a big fulcrum which is the lifting front wing. Nothing else besides the front wing is lifting UP. The stab pushes DOWN behind the fulcrum to lift the rig UP in front of the fulcrum. The weight of board and you are balanced over the fulcrum if your feet are able to exert the same, or nearly the same, pressure. You ensure this by getting the front wing at, or near, the midpoint between your feet. If it is too far aft, you can't get it to lift at all. If it is too far forward, you can't keep it down and under control--it just foils out. Of course, all this varies a little with sail size, wing area and aspect ratio, wind speed, water conditions, sailor weight, and sailing style. However, if you start with these settings, you will progress much faster than otherwise. I know all of this from personal experience with my own initially out of balance windfoiling gear. This "front wing midpoint between feet" stuff applies also to kitefoiling as well as surf and SUP foiling, If you examine the gear of successful foilers on the beach you will ALWAYS find the front wing near the midpoint between front and rear footstraps. It's just basic teeter-totter physics. I agree there has to be an easy starting point, and I suppose yours is good as good as any ;). I believe these settings work for your setup, and that they work for others who just began as well, but it is definately not what I'd recommend to anyone trying to improve their technique after the first few sessions. Instead I'd recommend more frontfoot preassure and to go out in more marginal winds, gradually building up the windspeed instead of down. look at the setup below: the frontwing is about 3/4 between the straps, straps quite close together, I'd say less than 40cm, and my mastfoot quite far aft. (I ride my frontstraps and mastfoot another 4cm further aft now than in the picture). Because the wing is at 3/4 it allows me to comfortably sail with my backfoot out of the strap at 1/2 between the straps, meaning I have plenty of power to foil through jibes and 360's, I've even made 2 fully foiling tacks already with this setup. Sailing with a setup like this (maybe not as radical, but close) will learn you the correct technique faster. Ofcourse the setup is way more powerful with the straps and mastfoot further aft, so it'd be better to begin in less wind to keep control and learn the proper stance (being overpowered might feel way too much in the beginning with frontfoot preassure if you are not a freestyler). In the end progression will be way faster. I have been giving foilclinics for over a year now and get my students up and flying in 8-10 knots with a 7.0 their first session, and sailing quite stably after 2-3 3-4hour sessions. One of my students now regularly comes sail with me and is starting to steadily fly through his jibes after only half a year. Do with it what you want, I still believe settings are way more gear dependend than you make believe, and therefore would not dare just say "wing at 1/2 between straps and mastfoot at 44inches", I'd recommend letting an advanced foiler trim your gear and if that's not possible look closely at the production video's on youtube and try to copy their settings to begin. I agree that your setup is great for advanced foiling where you ride with front foot pressure. Tony Logosz talks about this as well in his online foiling academy. However, if beginners go out on your gear with the wing that far forward and the mast base that far back, they will do nothing but foil out as soon as they get any speed. They will wonder how anybody can possibly foil this way. If, however, they start with midpoint, 44 inches, and equal foot pressure, they will at least get a few short rides and start to get the idea of how this all works, and they will start getting their muscle memory developed for this sport. Then, at that point, they can fine-tune their gear by moving footstraps and mast base. The rides will get longer and better. Eventually they will blasting around in total control and high speed with a forward front wing and aft mast base. Yes! The longer Fuse helps with stability and is more forgiving when adjusting foot position under flight. I think you have a fair point. To be honest it just eats me up that a lot of people are foiling around like sandbags after having had a foil for over a year and I just really badly want to help those people progress faster, since its perfectly possible to be doing fully foiling jibes in half a year (Ben Proffitt did it his 3rd session so...). This is making me sometimes push too radical setups to soon maybe. However it has to be noted that once comfortable (or remaining being uncomfortable for too long!) it is important to start experimenting with more power in the front to keep being able to progress! Hahaha, I don't have a video and like I said, only made it twice, there is a video of Balz doing foiling tacks a lot cleaner than mine. He does a ducktack, whereas I did it by getting my sail clewfirst before and just steer the board and step around which also kind of works. Gotta try the ducktack too cuz it looks cooler haha. I almost never try because the wind/sailsize has to be perfect, too much and it becomes heavy (I'm not good at sailing clewfirst on the regular board at all, on the foil its a little easier but still something I'm practicing), too little and you wont stay foiling. And its like a 2knot range somewhere fairly low down but not too low. I would like to use the 84 wing aswell. Does the 84 fit the foil works fuseledge good (like the slingy fuseledge). Windance said they will be hopefully testing the foil works foil with the new 2019 slingshot Wings in the spring. Do you use the 90cm mast? I have an 84cm Infinity on a Foil Works fuselage and it fits perfectly fine. I've had two sessions, one I just bobbed around because the wind died and the other was great but freezing. There was someone on another forum I follow who apparently didn't get quite a perfect fit until he filed down a part of his fuselage. As far as I know though the Foil Works stuff, like the Ride Engine kite foils comes out of the same factory as the Slingshot stuff. I think another reason you might not want the wing too far forward (requiring too much front foot pressure) is when downwinding powerful wind-swells. Accelerating down the swell creates instant extreme lift, requiring weight transfer well forward, downward pressure on the mast and depowering the sail to avoid foiling out (at least for me) - and that's with the Slingshot Infinity wing in B fuselage position (midpoint - stage 2). For the few times I have been in the shorebreak with my foil, I just take out the backfoot when going down a swell, helps me to be more manouvrable aswell and can easily put it further forward to decrease power (I think not being afraid to take out the backfoot is one of the keypoints to stay foiling with more power and stronger winds with a more powerful setup, to me not having to have the backfoot in the strap is one of the big plusses for the freedom of foiling). having a single backstrap works wonders aswell in removing power. if you want to keep both feet in the straps and dont have a single backstrap or very close together I'd say it is nearly impossible with a lot of frontfoot power, especialy because you cant really weigh the rig to keep the nose down as in racing. Azymuth, How many different positions can you move the mast on the fwind1 fuseledge? I'm new but moved the rear straps well back so I could out my foot in front or in strap. Glad to see your foil works is working out for you though. Does your mast "sing" make noise when up on the foil? Wingbot, Could you post a picture of the bottom of your foil works mast to see if the foil works aluminum masts are as thick as the slingy mast. I believe the Foil Works base plate may actually be slightly thinner than the Slingy plate. If i can find my old calipers i can take a measurement. The Infinity slid on perfectly easily on the Foil Works fuse. Once i slid it on i had to back out the fuselage a bit less than a centimeter to align the bolts if that makes sense.